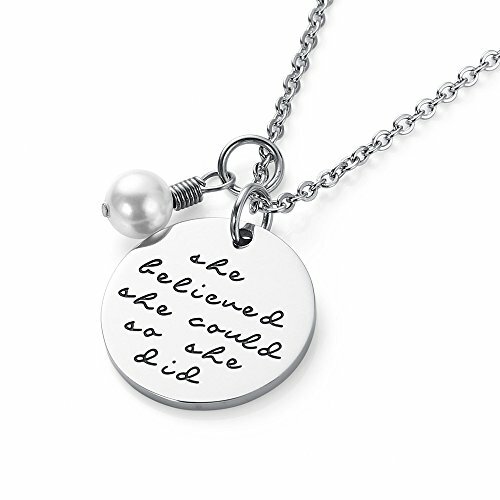 Warm Words: \"She Believed She Could So She Did\". Always believe that you can, and you will. The power of believing in yourself is stronger than any force of nature yet. Premium Material: The Disc tag and chain are super stainless-steel, smooth tag & chain surface, lightweight and hypoallergenic, will not rust, change color or tarnish. Inspirational Gifts: It\'s a great choice as Heartfelt & Meaningful gift for Parents, Grandparents, Friends to their little girls. this will be a helpful reminder to keep them cheer up during hard times, let your girls know just how much you love her. Measurment: Disc Tag Diameter: 26 mm. Chain Length: 50cm. It can be adjusted the length as your require, make sure it will fit perfectly on everyone. With a 8 mm Shell pearl, beautiful and cute.